My youngest son and I love going on walks, he scooters while I walk beside him, and one morning on our walk we were discussing what cake I will be making for his birthday. He replied as per normal that he doesn't want a cake, this year he wants a pie. He couldn't decide on the filling, he was tossing between an Apple, Berry and Rhubarb Pie or a Blueberry Pie, but then he asked if it can be a crumble pie also, as he loves crumbles and he loves pies. 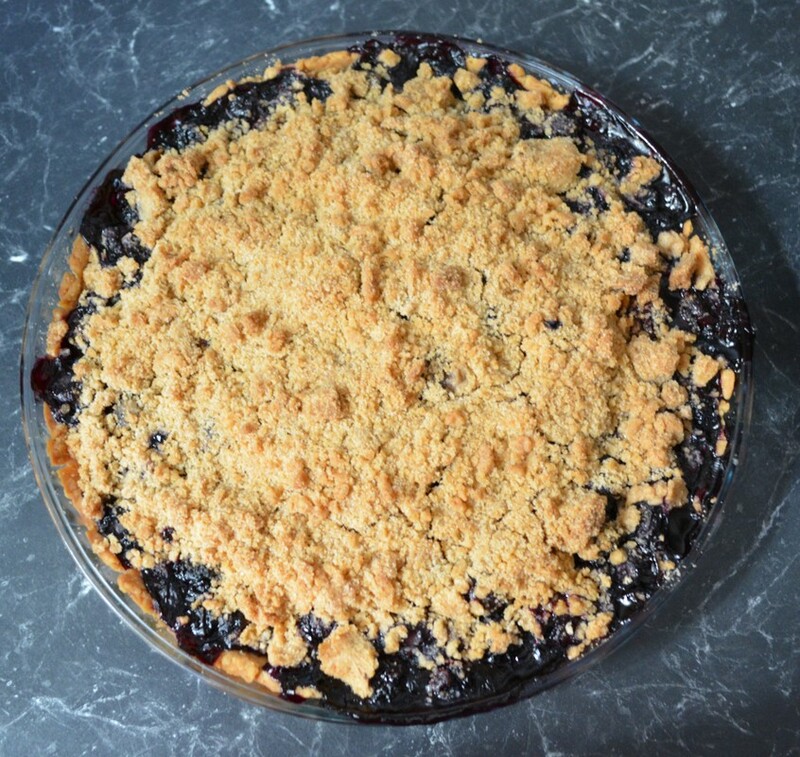 So I knew I had a recipe for an Apple, Berry and Rhubarb Crumble Pie, but I had to find a Blueberry version, and here it is. This was delicious, simple and tasty. The pastry is really easy to make, you just stir the ingredients together, the filling is just as easy, you just stir the ingredients together and the crumble topping you blitz up in seconds, if you do it by hand it could take a little longer, but still very quick. In the end I decided to make both pies for him as I had a pastry recipe that would make enough pastry for two pie bases. This will definitely be made again and again in my house as it is easy to make and tastes so good and there is just something special about making a pie, they are so pretty and who can say no to pie. Make the filling: Whisk together the sugar, cornflour and lemon zest in a large bowl. Add blueberries and lemon juice, toss gently to coat and evenly distribute. Let filling stand, tossing occasionally, until blueberries release their juices, 20-30 minutes. Meanwhile, make the pastry: In a large bowl, mix the flour and salt together. Pour the milk and oil into a jug, but do not stir it. Add the oil mixture to the flour. Stir until mixed well, knead for a minute or two, then shape into 2 flat balls (it will be crumbly, squish it together). Wrap in cling film and refrigerate for 15 minutes. Preheat oven to 180C/160C fan forced. Grease a large pie dish with cooking spray or butter. Roll out half of the pastry between two sheets of baking paper. The pastry can be crumbly, if it is keep flipping it over, while rolling, as I find it the easiest way to get both sides smooth. If it splits or cracks around the edges pinch it together. Roll out until it is 3-5mm thick and will cover the base and sides of your pie dish. If you have cracks or holes, use a little pastry from the leftover pastry, to press onto the cracks. It doesn't matter if it isn't perfect looking, just make sure there are no holes in the base. Place the pie base in the oven for 10 minutes. Cool slightly. Make the crumble topping: In a small food processor add the flour, brown sugar, caster sugar, cinnamon and salt. Blitz for 5 seconds to mix it together. Add the cold butter and blitz until it looks like coarse sand. Assembly: Spoon the blueberry filling over the cooled pastry base. Sprinkle over the crumble topping. Bake pie until the filling is bubbling and the top is golden, about 1 hour 15 minutes. Cover with foil after 30 minutes if the top is browning too fast. Allow pie to cool, eat warm or at room temperature with a scoop of vanilla ice cream.